Some of the most cherished childhood memories we share as Kiwis are those we create on a family holidays. There is something magical about escaping your day-to-day life and enjoying new adventures in a holiday destination. Removing yourself from stressful daily routines gives you a genuine sense of freedom. By taking away those strict bedtime protocols and demanding schedules allows families to simply enjoy each other’s company. We run a very family-friendly Holiday Park and we love to see the value our guests get from their well-deserved breaks. With the laid-back atmosphere and plentiful outdoor activities, the memories families create here are sure to last a lifetime. We see many families making use of our Holiday Park throughout the year. On the day they pack up to return home, they appear to have had a weight lifted of their shoulders. Let’s look at why Ohiwa Beach Holiday Park is the perfect place for families to reconnect and recharge. The purpose of a family holiday is to be together. The activities both within and nearby the Park offer great opportunities for families to relax and enjoy time with each other away from home. A day out surfcasting can spark a new love of fishing for the little ones. The peace and serenity of Ohiwa Beach is also a calming place to enjoy each other’s company without external stresses. We see whole families head down with their fishing rods, some even throw in some healthy competition to see who’ll get the first catch! It’s not every day that we get to see hundreds of glow worms twinkling in the darkness. Beginning with a stroll through the Ohiwa Nature Trail, this is a must-do family activity. The kids will be sure to cherish this experience for years to come. Our pedal cars are available for hire within the Park. With one taking the wheel and one riding as a passenger, siblings can test their team spirit. We hear lots of giggling coming from kids on the pedal cars and they one of the favourite activity for many of our guests. Our idyllic setting is the perfect spot to get out and be among nature. We have several great walking tracks in our back yard where families can take in the stunning ocean views as they surround themselves with native bush and birdlife. What would a Kiwi family holiday be without the beach? Ohiwa Beach is a safe beach for swimming and boogie boarding. 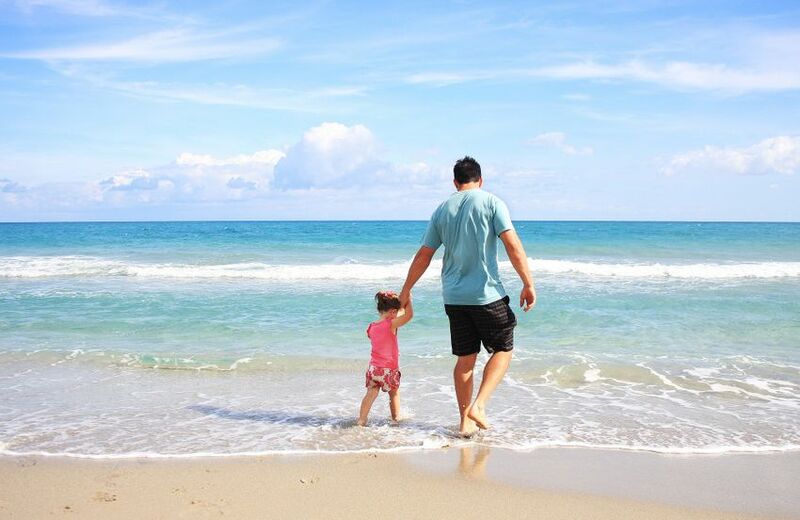 During summer, families often spend whole days at the beach, building sand castles, flying kites, sunbathing and cooling off in the fresh ocean water. We take immense pride in our Park. The facilities we offer and the standard at which the Park is maintained sets us apart from other camping locations. Our playground and bouncy cushion are always a hit with the kids. These facilities are great for creating new friendships and they are well utilised throughout the year. We keep the playground and bouncy cushion well-maintained to ensure the safety of the children. We have also installed a shade cloth over the bouncy cushion to keep the kids cool in the summer heat. Should the weather take a turn for the worse, we have a fantastic games room to shelter in. The games room is equipped with table tennis, pool and air hockey tables – great for families who have a competitive streak! We also have a TV in the games room as well as a collection of books to enjoy. There are two kitchen areas and camp cooking has never been easier. Our pristine communal kitchen blocks are spacious and fully equipped with the essentials. Families often come to the kitchen to cook together and to socialise with other families on holiday at Ohiwa Beach. Did you know we have a new pool? We are delighted to have a pool area for families to enjoy! This new addition to Ohiwa Holiday Park is ready and waiting for some great summer fun. Nestled in the corner of the Park, the pool is sheltered and fenced with plenty of cape cod-style chairs for parents to enjoy while watching the kids play in the pool. We have also set up a shaded toddler pool for the littlies. We are so excited to finally have the pool and we can't wait to see our guests having fun in there! If you feel like you could really use a break, you can't go past Ohiwa Beach for a family holiday location. From great entertainment to excellent accommodation, Ohiwa Beach Holiday Park has it all. Refresh your family's spirit and book your stay with us today.